I'll start this post with a notice: I had a piece published in a recent Mollie Makes (Issue 45) all about Melbourne's Rose Street Artists' Market. It's Fitzroy's answer to Brick Lane's artsy, craftsy markets. If you fancy reading the article, it's HERE. With some smashing accompanying pictures by the gentlemanly and marvellous Corey Sleap. So having read the article you've obviously decided to visit Melbourne. Once here I'd also also urge you to hop on a tram and visit what is one of my favourite crafty establishments of repute and elegance: l'Uccello Haberdashery. Remember the blogpost about the Nicholas Building and its role as Melbourne's hub of textiley wonder? L'Uccello is in there. Imagine Liberty and V.V. Rouleaux had a love child who - once all grown up - then eloped to Melbourne with an 19th-century French haberdasher and had yet another child. That would be the anthropomorphic manifestation of l'Uccello. 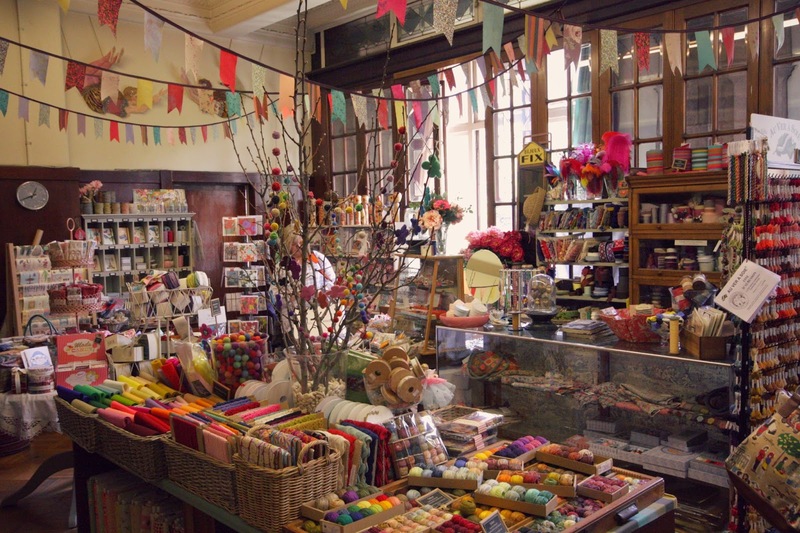 It's an emporium of delight, discovery and wonder with vintage haberdashery, Sophie Digard's crochet pieces and knitwear, Valdani embroidery threads as well as delicious ribbons and trims... all for sale to the discerning. A day and an age ago, the owner, Kim Hurley very kindly took a few minutes to have a chat with me. Now, my original plan had been to quiz Kim about her background - window dresser, moisaicist (more Sicilian school than Ravenna or Venice in case you're wondering) - and her transformation into an elite haberdasher who roams about Europe sourcing fabulous stuff from a select group of textile artists, craftsmen and antiquarians. The creative possibilities that l'Uccello affords is somewhat spectacular. Jolly good thing I did my research before I went along for the chat as someone has already written a piece on the intermeweb with the pertinent points here. And it would have been tedious for Kim to repeat all that information which is already out there. "Passe... what?" I hear you cry. Passementerie. You know, all the elaborate bells and whistles that used to festoon clothes in the days before the rise of polyester and the velour tracksuit? You know, fringes, galloons, gimps, rosettes, tassels and the Mighty Pompom? If you want a 19th-century interpretation, here 'tis. 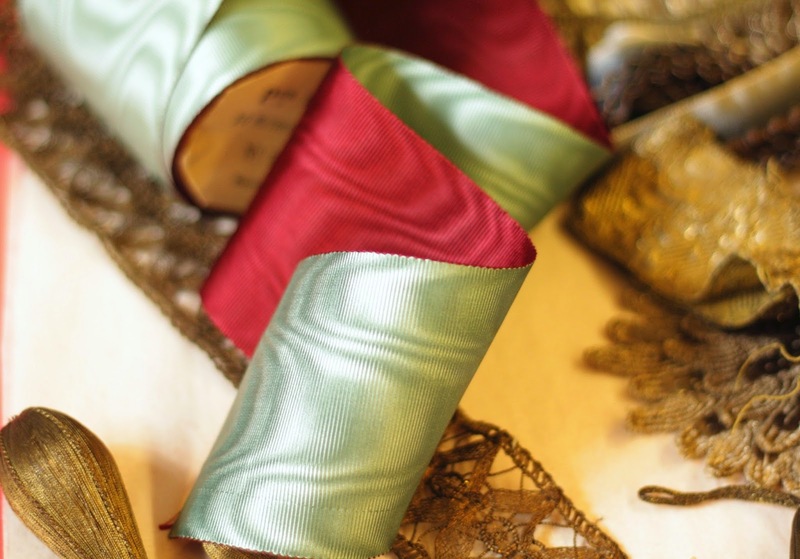 Today, passementerie is generally associated with furniture upholstery but Kim collects lovely pieces of brocade and embellishments made of gold and silver thread that were intended to adorn clothing. 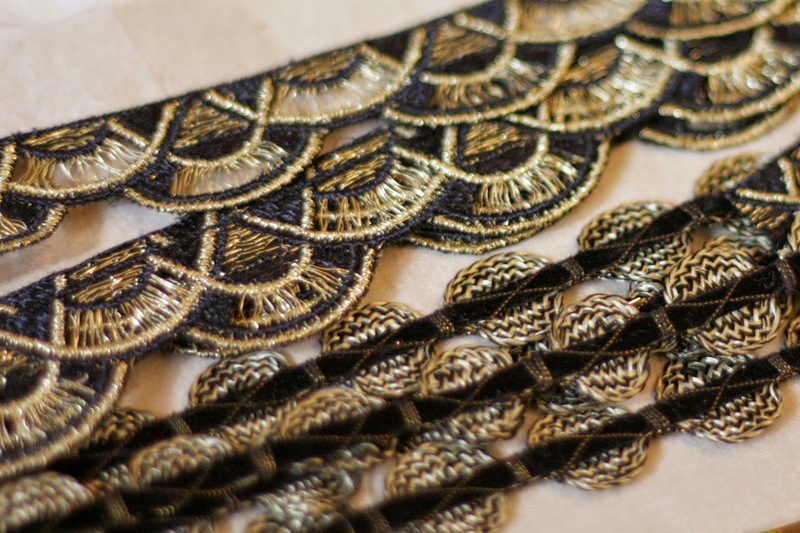 Imagine lacework but with silver, or tassels of gold. Then attach it to your clothes - or in the case of Catholic clerics, your vestments - rather than your chaise longue. 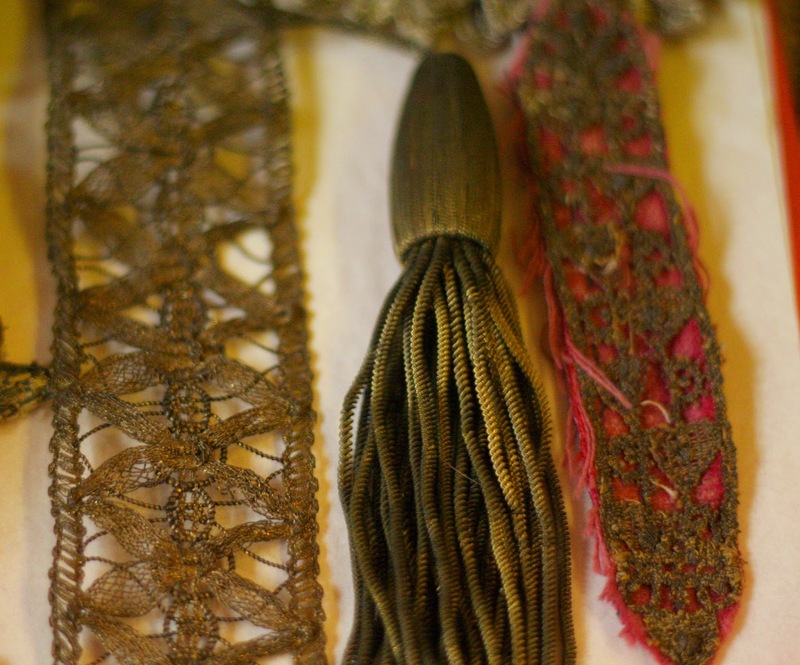 A few examples of antique metallic passementerie in Kim's collection. 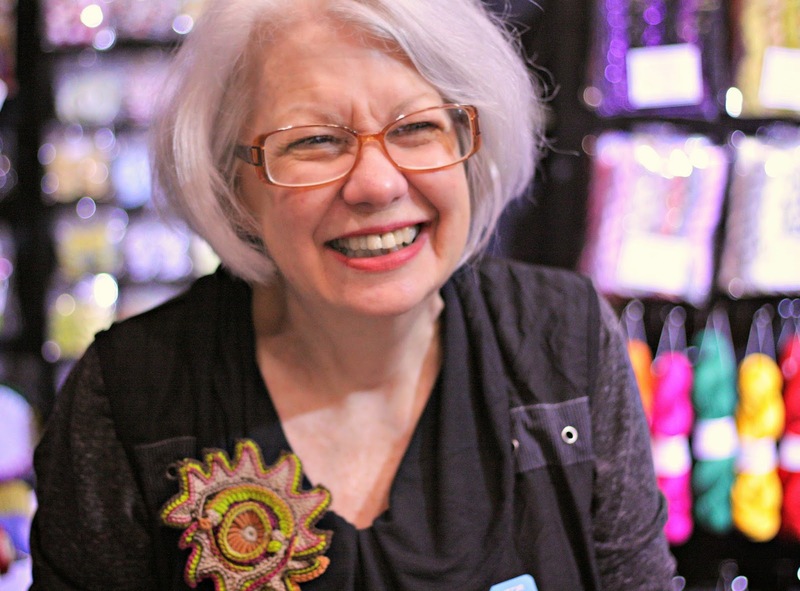 Much of Kim's collection was in storage at the time of our chat but, with sparkling eyes, she went and found a basket of various delights including some metallic passementerie, vintage fringing and embellishments. 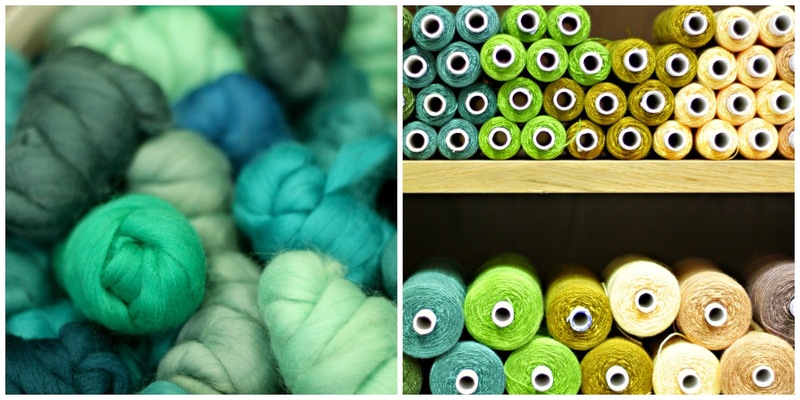 Basket of textiley delights and wonder! 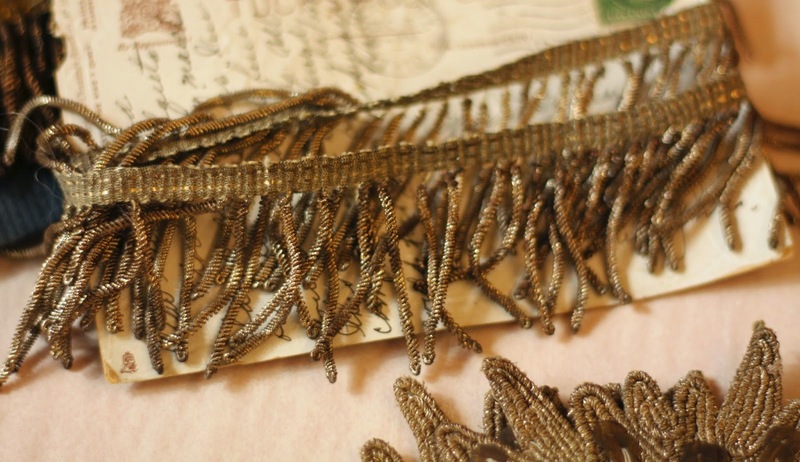 Some bobbins with the metallic thread that was used for lace-making or the construction of weightier tassels and trims. 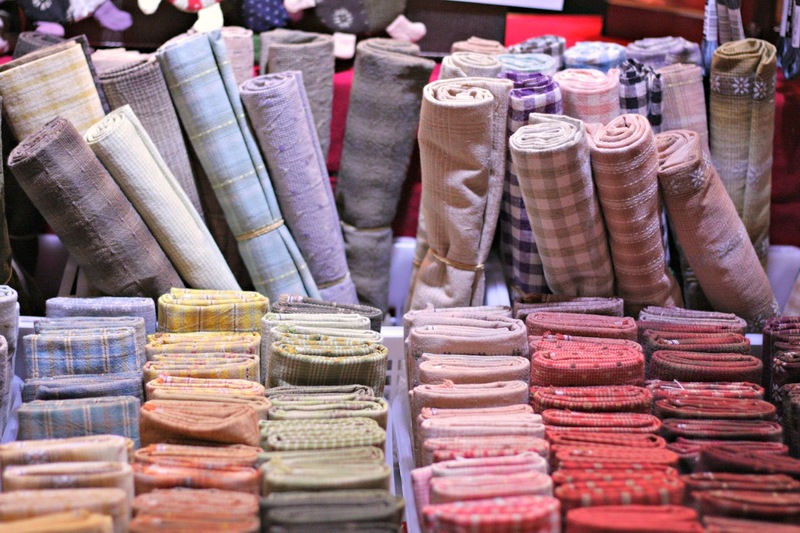 There is so much that is wonderful about such a treasure trove of textiley delights. It gives a searing insight into the collector's taste - defined by personal experience, knowledge and style - as well as sends the imagination soaring with all the creative potential and permutations such a a collection holds. Finally, it probably comes as no shock to regular readers that I find the historical weight of these pieces utterly fascinating. This two-tone silk moire is the sort of striking creative fodder that would set the heart of any miliner racing. The incredible skill, experience and talents of the craftsmen and women behind each galloon and tassel is not to be underestimated. 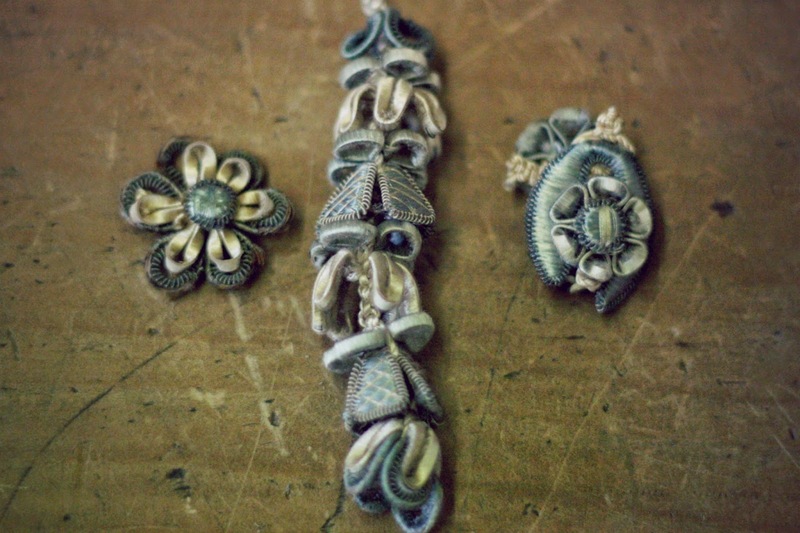 Never mind the cost of the precious metals themselves that were the basic materials for the passementerie, but think of the years of training, the practice and the hours necessary to create these complex and beautiful objects. 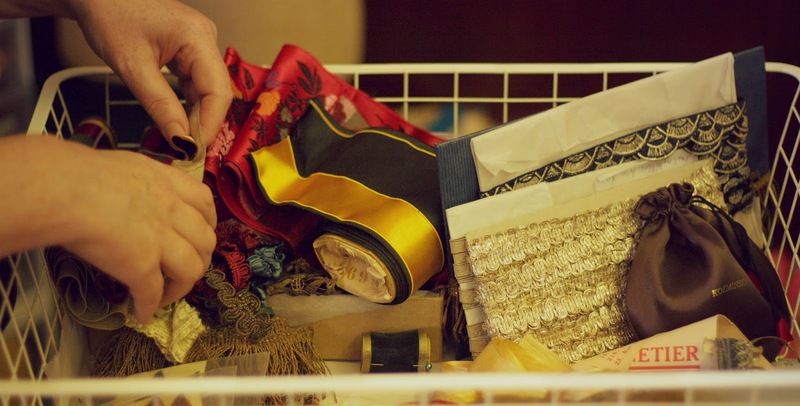 For those who could afford to decorate their clothes with such exquisite and luxurious details, such an act defined in great beauty and theatricality not only their role in society but their place as an economic and ultimately creative prop. A few more examples of metallic trims. 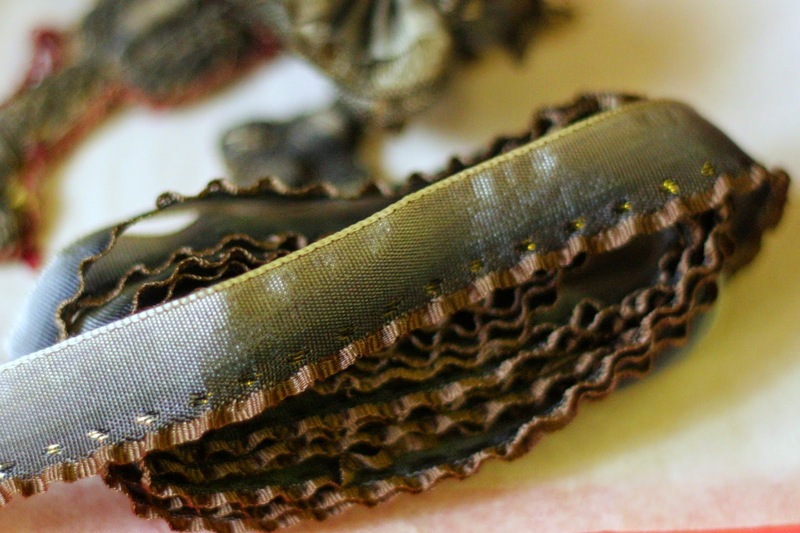 In this instance some lovely patina'd tassel that is yet to find a home adorning a frock or suit. 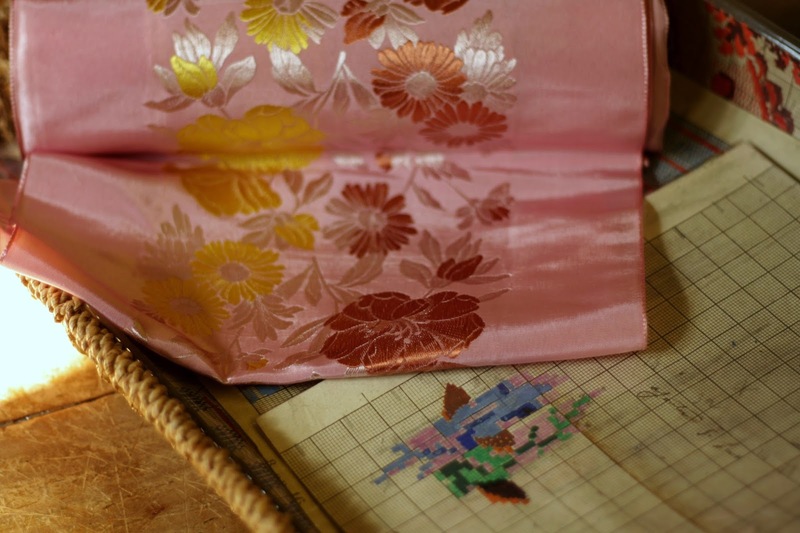 You see the graph paper with the flower picked out in tiny squares just underneath the woven silk? Although not the design for the ribbon in question this working sketch is from mid 19th-century Lyon and was one step in the creative and manufacturing process that resulted in textiles like the floral ribbon we can see. 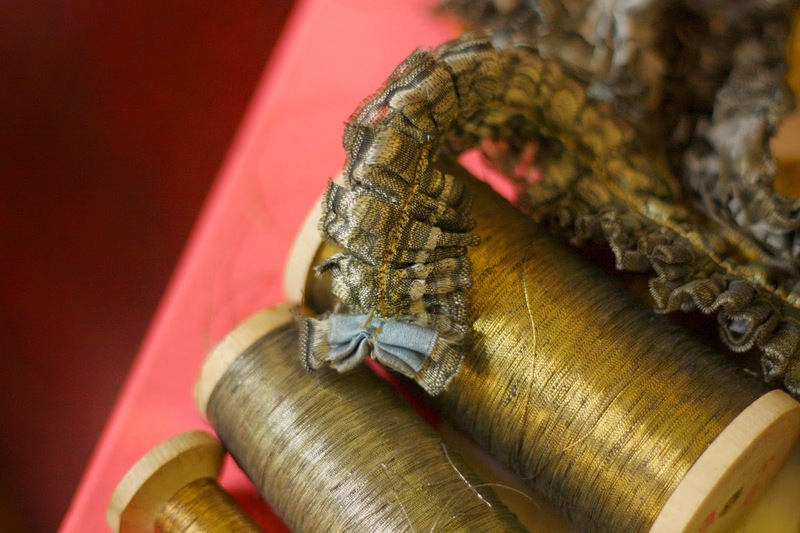 These two pieces in a basket in 21st-century Melbourne give us a glimpse of the complex silk-weaving industry for which Lyon was famed in the 17th, 18th and 19th centuries. For a taste of the rich history, there's a V&A article about one of the main silk designers of the 18th-century, Jean Revel. It's pretty amazing stuff. * That sketch you can see above though is also a small part of the history of computing. If you've heard of Jacquard silk and its punch-card patterned weaving technique that revolutionised Lyon's silk design and production, then you're also aware of an early and important step towards computer programming as we know it today. This was one of my favourite trims; a ruffly, ombre number that would look exquisite on some sort of evening dress affair. And all this innovation and beauty because a few people - well actually, an awful lot of people. Enough to support entire industries, markets and the economic backbone of cities, nations and empires - wanted to dress up in silk frocks and shirts. I don't think a preponderance of hessian sacks for millennia would have had quite such a profound impact on culture and society as we know it. Art deco style metallic trims. If you're interested in contemporary passementerie have a look at Jessica Light in Bethnal Green, London. Here you have a hint of the variety and panache a centuries' old craft can have today. It's exquisite, playful and luxurious, the latter mainly due to its handmade quality. More of this, please, and less of the velour tracksuits methinks. For those of us in Melbers though, we are rather fortunate to have the wonderful trove of embellishment and - I quote - "fancy goods" that is l'Uccello just on our doorstep. Enjoy! With thanks to Kim Hurley for taking the time to show me such an exquisite selection of haberdashery. It's always a privilege and pleasure to listen to someone who has such a passion and profound knowledge of their field. Aren't we lucky it's such a beautiful field that Kim is blessed to work in? 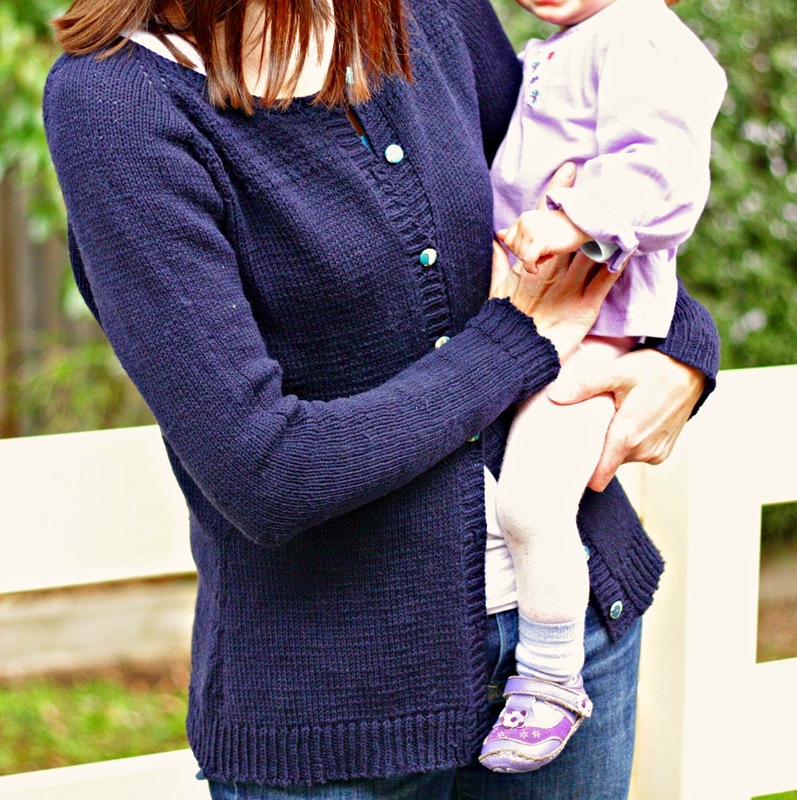 The Heathered Cardigan in Quince & Co 's Chickadee. It's been a while, but here's a post about Something Wot I Have Made. It's a cardigan. 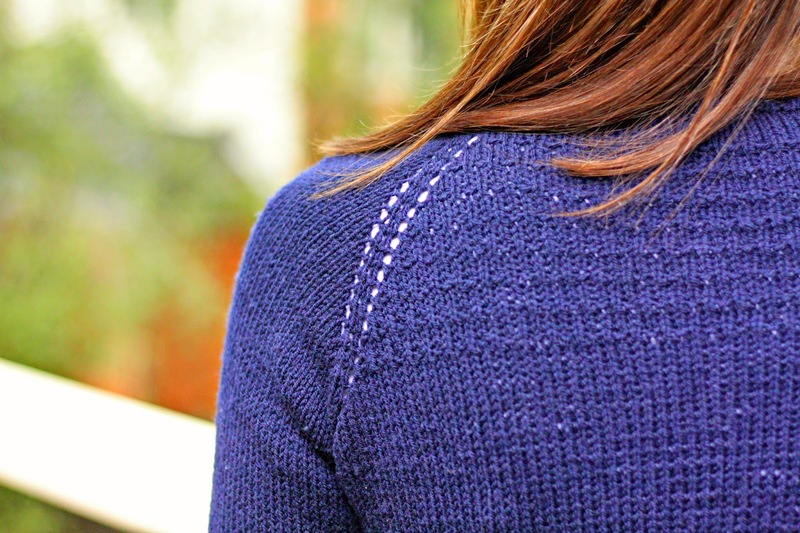 A simple, navy blue version of Melissa Schaschwary's Heathered in Quince & Co's Chickadee. Peacoat is the hue in case you're wondering. 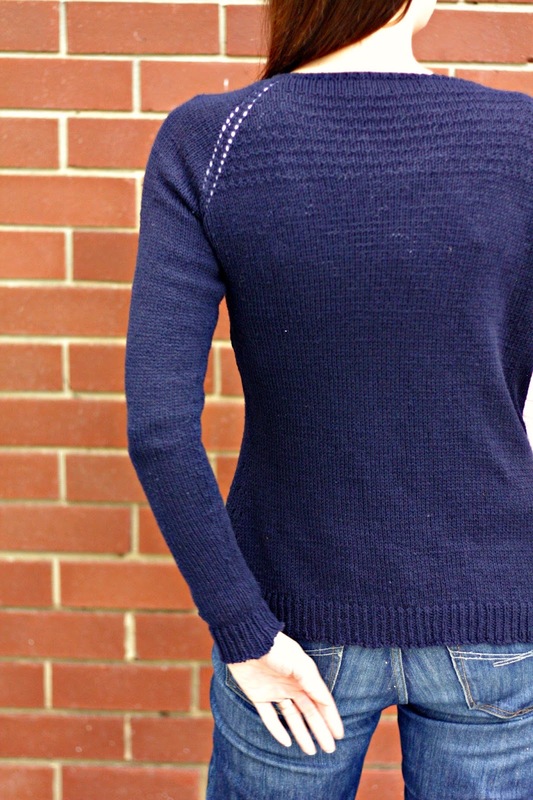 For all it's wearable simplicity this is a special cardigan. One imbued with personal knittery significance and strong connections to the Great London Yarn Crawl. More of that later... first a look at the cardigan. Behold! A lovely, long cardigan for lovely, long people! It is in fact a grown-up version of the fluffy angora, Hackney-hisptery Cricket that I knitted for the Cherub last year. Fortunately, or sadly (depending on your view of things like how very quickly these tiny ones grow) the Cherub is now too tall for the Cricket and all its fluzzy glory so I can wear the Heathered without fear of too many Mummy - Daughter Matchy - Matchy concerns. Anyhoo, having overcome these herculean obstacles I am finished. Overall, I'm pleased. No longer will I have to worry about cold wrists or an exposed sliver of torso betwixt trouser waist line and cardigan edge. The Andalusian stitch along the yoke adds a bit of texture and interest to what is destined to become a daily knitwear staple. Andalusian stitch detail along the yoke. Chickadee is a soft, bouncy yarn and a delight to work with. There has been some piling since washing and blocking but huzzah! for those those whizzy handheld de-piling machines. I am now free of unwanted bobblage. 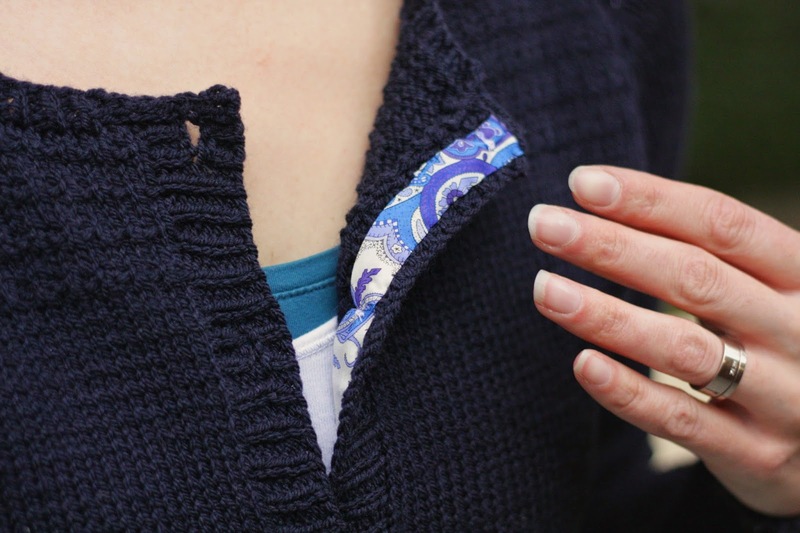 I chose Liberty Tana Lawn ribbon for the inside of the button band as well as for the covered buttons to give it a bit of ooomph beyond the Andalusian stitch. Easy tigers. It's a flash of Liberty Tana Lawn behind the button band. Calm yourselves. The downside? I'm underwhelmed by the wibbly tubular bind off on the sleeves and at the bottom of the waist that the pattern demands. The answer probably is that I need more practice rather than there being a problem with the cast off itself. But it is indeed stretchy as promised ensuring I won't cut off the circulation to my hands. Which is important. Wibbly tubular cast off on the sleeves and the tell-tale rib of the Magic Hoop method. Apparently the latter will disappear over time. But, behold! The length of sleeve! The resultant warmth of wrist! So, that's the cardigan bit. But what of the special significance? It's been almost a year to the day since I chose the cardigan pattern and then went off on quite a romp to acquire the yarn. 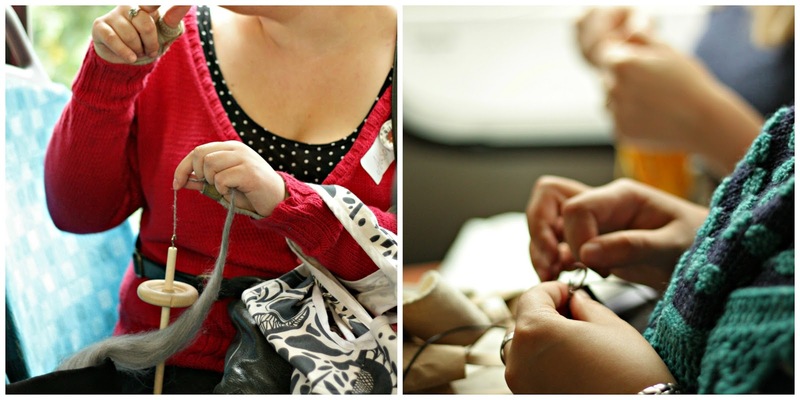 This Saturday will be the 2nd Annual Great London Yarn Crawl. 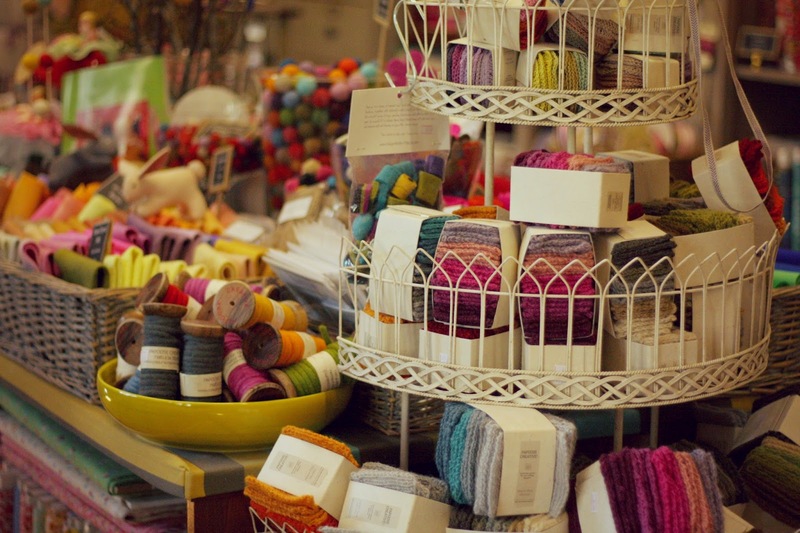 Essentially, it's an excuse for a whole heap of keen knittery types to gather and dash about en masse using London's public transport to visit an amazing selection of the Capital's best yarn, knit and crochet-type shops. 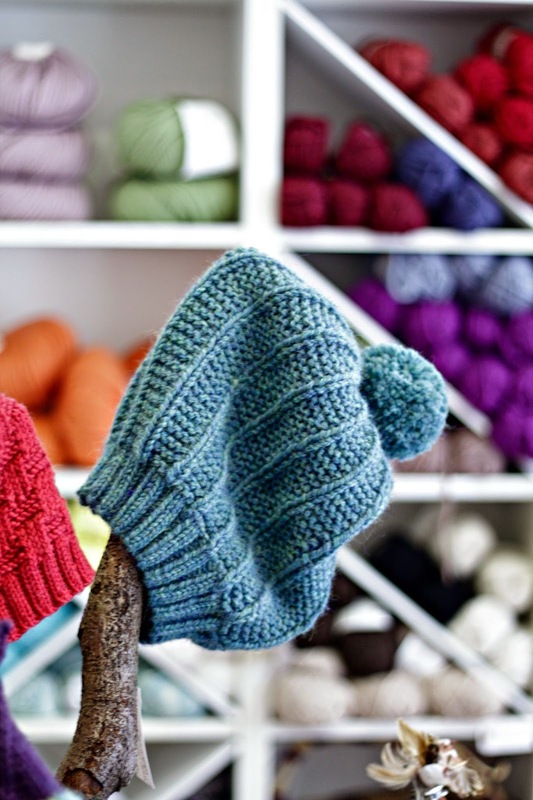 Keen knittery types have a rollicking day out, independent yarn shops, spinners and dyers get support and contributions are made to the charity Refuge. Happiness all round, methinks. Sadly, I won't be able to pop over the 17,000 km between Melbourne and London to partake this year's phenomenon. However, I was lucky enough to have been involved in 2013 for the first Yarn Crawl when I bought the yarn for this Heathered cardigan at Loop in Islington. Pondering last year's Crawl I've realised how it's proved an important marker in my writing and knitting life. In March 2013 I was a random punter visiting Wool House at Somerset House and met Rachel Brown and Allison Thistlewood whilst they spun away as part of a demonstration about, you guessed it, spinning. Little did I know what madcap venture they were planning, a venture known by the quango-ish acronym the GLYC. Six months later they'd corralled me; I was a volunteer leader for a group of Crawlers dashing about London like a crazed thing. WARNING: Gratuitous crafting on public transport. Including drop spindling. The results of that Saturday included a whole heap of fun, much caressing of skeins and succumbing to temptation followed by acquiring enough yarn for a cardigan as well as the chance to meet some amazingly interesting, textiley people; Renee Callahan of East London Knits (my patient and witty co-leader on the GLYC), Dani Sunshine of Lioness Arts and organiser of Unwind Brighton, Linda Lencovic of Kettle Yarn Co. and Kate Metherell of Yarn and Knitting to name but a few. Until the GLYC, I'd no idea such things as Freelance Knitters existed. Now I do. And it's fantastic. 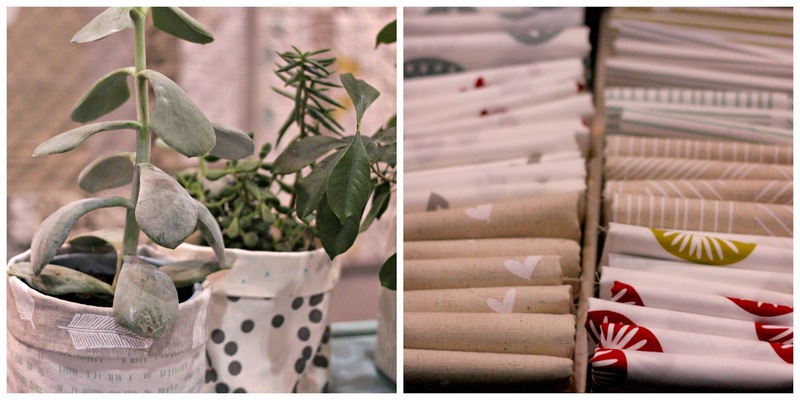 I even had the delight of writing up all our adventures for an article in Mollie Makes. Therefore, I wish much merriment and delight to all those involved in the GLYC this Saturday. And if you're not going, sign up and make sure you can go along next year. 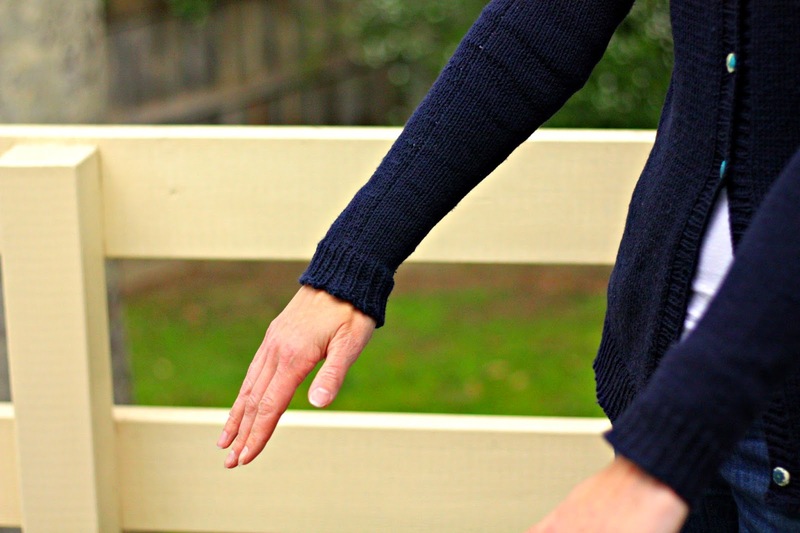 Then knit yourself a cardigan from the yarns you buy en route. From such things are memories made. 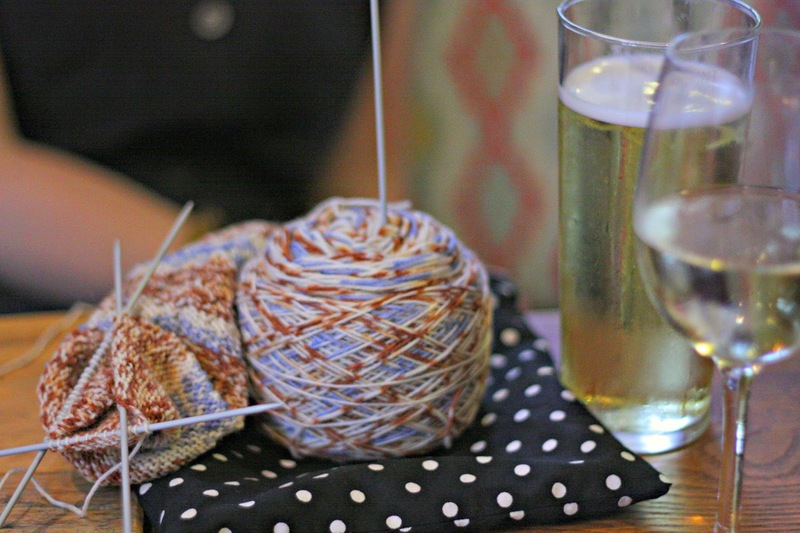 Wine, cider and sock yarn at the GLYC 2013's after party. Happiness all round. At last! 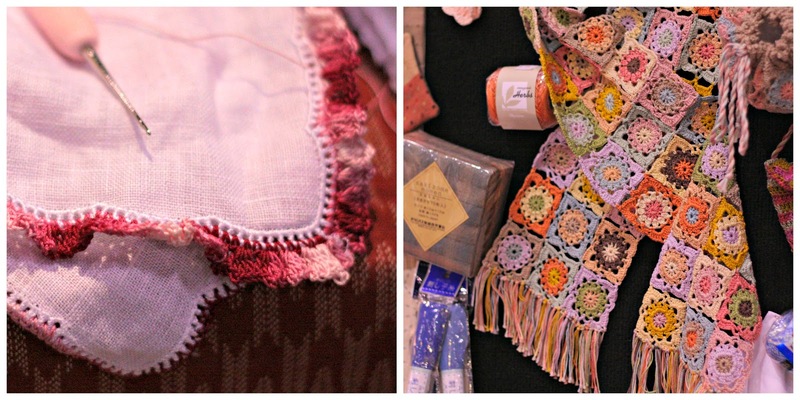 A few minutes to jot down thoughts and impressions from the Craft and Quilt Fair in Melbourne back in June. This is Australia's impressive answer to Ally Pally's Knitting and Stitching Show so it was only right and just that I pop down to have a look. Thus I rose early on a Saturday morning. However, the trip almost began and ended in disaster as I made my way to the World Heritage listed Royal Exhibition Building. This is one of the only remaining structures from that great binge of Royal Exhibitions during the 19th century, the most famed probably being that of Joseph Paxton's Crystal Palace for the Great Exhibition of 1851. Even today Melbournians use the building for which it was designed; as a space for exhibitions and fairs. It's also a bit similar to Alexandra Palace. Where they hold the Knitting and Stitching Show. Bally good thing I realised before I reached inner Melbourne that the Craft and Quilt Fair was in fact at the Melbourne Convention and Exhibition Centre. It's a kinda similar name to the Royal Exhibition Building what with having the word "Exhibition" in there. It also has the same function but is of a much more modern vintage, built in 1997. Funded and supported by Victoria's (as in the state, not the former Queen) Premier of the day, Jeff Kennett, this somewhat utilitarian building is affectionately and laconically known as Jeff's Shed. And once inside, oh my. The Fair was Good. I would suggest to the organisers a minor yet significant change of name from the Craft and Quilt Fair to the Quilt and Craft Fair as there was a lot of quilty-themed stalls. Loads in fact. Oodles. I'll start with the magnificent exhibition of quilts made by members of Victorian Quilters Inc. What an array of talent, colour and beauty from the hands of young girls starting their patchwork adventures to venerable matriarchs with decades of experience behind them. No pressure, Willis. No pressure but that is a rather fine patchwork quilt there. In one corner were some ladies industriously sewing, supporters of the Victorian Quilters' Very Snuggly Quilts programme. After a bit of probing, I found this group of volunteers to be akin to the good people of Free Cakes for Kids. Instead of cakes they make quilts, elaborate, stunning quilts for sick children at the Children's Hospital in Melbourne. As in children who may be terminally ill, suffering some terrible disease or possibly coming to terms with a life-changing disability. From premature babies to young adults, the quilters anonymously make quilts to general themes (say, girl aged 16 or boy aged 10) which are then taken into the hospital. Staff tell the Very Snuggly Quilt organisers which children and families are in need and a quilt is given. For free. At one of the most stressful and vulnerable moments in a child's life - or indeed that of a parent - a total stranger creates a beautiful, soft and comforting object and gifts it. It's a precious and generous act that brings some peace and hope to the recipients. All those examples of beautiful complexity and moral generosity were rather inspiring and I thus sallied forth into the rest of the Fair. I think the first significant point of difference between my experiences at Ally Pally and in Melbourne was how many quilting kits were on offer. One of my small frustrations about the various patchwork vendors in Britain was - for the beginner - their ludicrously tempting and large selection of fat quarters and bolts of fabric was generally intimidating. Staff tended to presume a much higher level of experience than I have so I would often slip away and head back to the yarn stalls. By contrast a number of the outfits exhibiting in Melbourne had kits and some of those "make-a-quilt-in-a-section-a-month" sort of kits (a bit like Janie Crow's monthly Crochet Club), with the promise of technical support as part of your monthly subscription. The monthly subscription is also a jolly good idea. 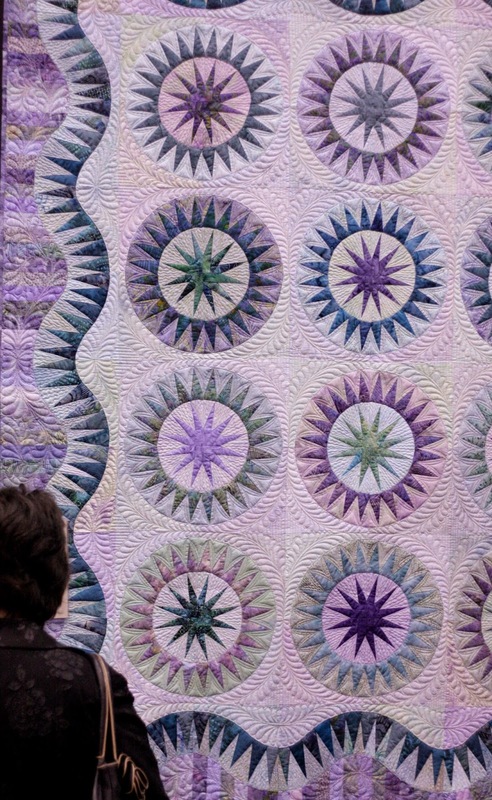 The thought of forking out several hundred dollars in one fell swoop for a quilt kit that is probably beyond your technical ability and might sit festering away in a craft cupboard for aeons, is eye-watering. This is all for the beginner, I hasten to emphasise. So hurrah! for the likes of Patchwork Passion and their Block of the Month-A-Longs and the ever-so-charming Crafty Squirrel of Ballarat. In the latter instance I was utterly taken by the retro palette and patterns that defined much of the Squirrel's wares. 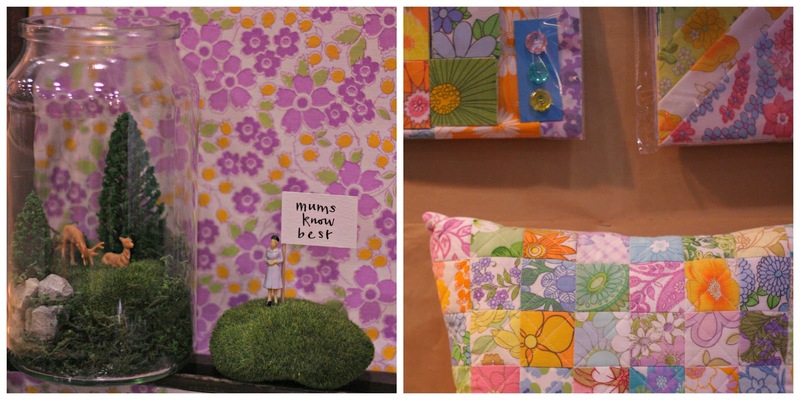 Bundles of fat quarters, cushion kits and quilt kits were all made from owner's Morgan Will's collection of vintage sheets, blankets and textiles. With the occasional faux terrarium and some Old School habredashery thrown in for good measure. Now, for those more au fait with patchwork and quilting then you were in for a treat with the fabric available from two vendors in particular: Robyn Shapiro of The Strawberry Thief and Leslie Keating of Maze & Vale. 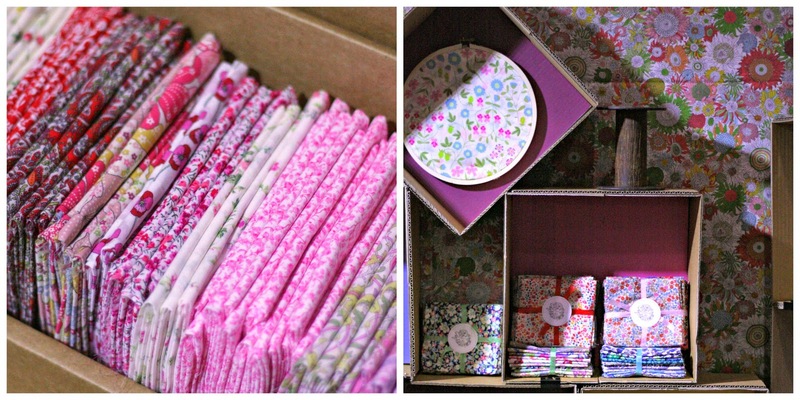 The former has many, many Liberty print fabrics to delight and amaze. 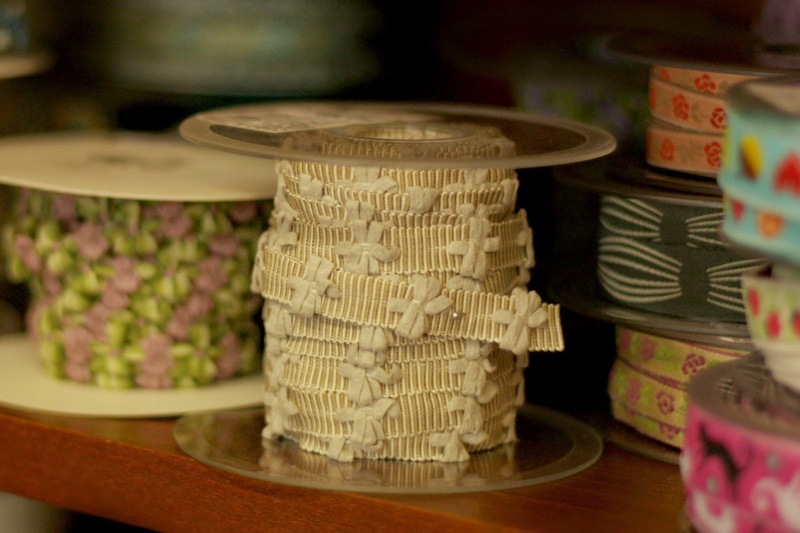 Actually, those aren't just for the quilters out there but have many, many crafty and fashiony possibilities. Plans are afoot for customers to buy fabric by the metre for projects beyond patchwork. Lucky Robyn has managed to take her love of the Tana Lawn and turn it into a full time job. I am in awe. Robyn Shapiro of the Strawberry Thief. I know this isn't a fashion blog but do note Tana Lawn headscarf and note how chic it looks. Leslie Keating is a textile artist originally from Canada whose screen-printed linens and cottons are invoke a muted Scandinavian aesthetic. 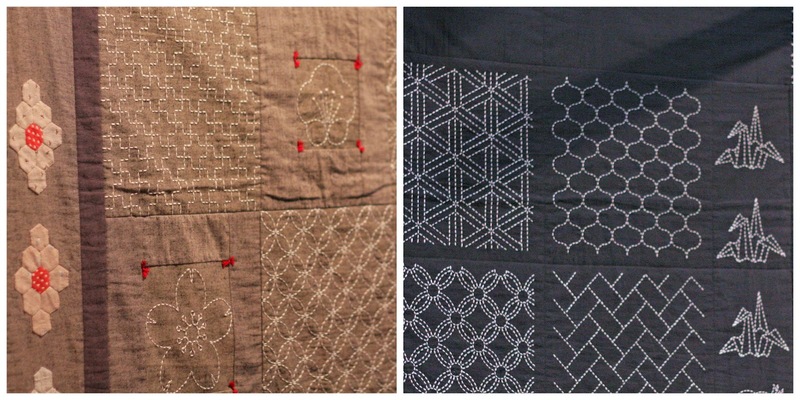 Again, Maze & Vale's fabrics don't limit you to quilts, but you would make some pretty striking and contemporary ones if you did decide to have a go. Leslie is also running some screen and block printing workshops in Footscray for those keen to dabble in a slightly messier and paintier realm of the craft and textile world. The delicate and contemporary prints of Maze and Vale, all designed and screen printed by graphic designer Leslie Keating. ... so let's get back to the sashiko! Much more worthy of note and reflective of contemporary Australian society. My two favourites were Mai Misaki and Bebe Bold. 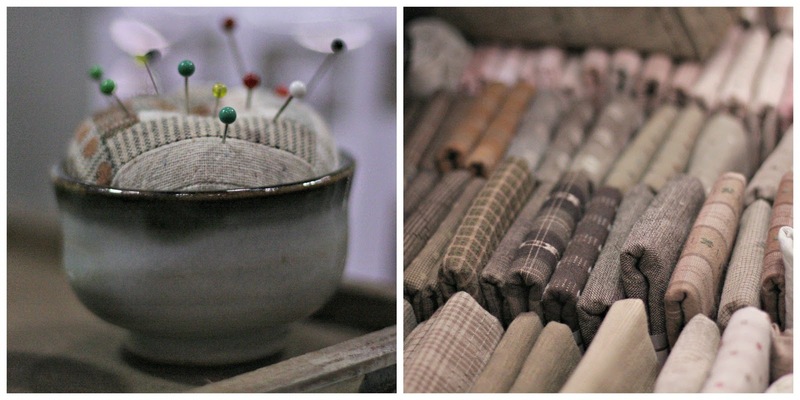 Mai Misaki was interesting as I hadn't come across the idea of so much taupe in Japanese fabrics. The passing knowledge I had of this vastly complex and rich section of textile history tended to reference brightly-coloured kimono material or indigo-dyed linens. But taupe? Lovely. And I suppose it makes sense that some bright spark a long time ago in ancient Japan thought, "why not leave the fabric in its natural colour? It looks better on me than indigo blue." Or some such. Oodles of taupe Japanese linen on offer at Mai Misaki. Bebe Bold has more of the classic indigo fabric on offer as well as many other contemporary Japanese textiles. The company's owner, Jane MacDonald, designs an number of the sashiko patterns herself, which are often helpfully printed in blocks on the fabric ready for you to stitch, cut the blocks, arrange yourself and construct into whatever patchwork project you fancy. Oh, and once washed the original white pattern lines vanish. Jolly simple yet effective. Sashiko patterns and projects from Bebe Bold. Jane MacDonald the owner - who originally hails from Oxford of all places - designs a number of patterns herself. 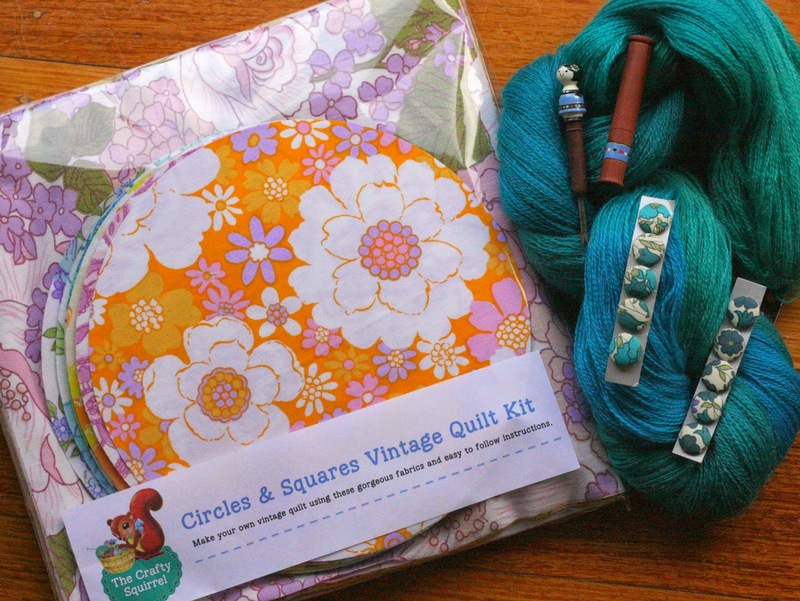 Bebe Bold also has quilt kits, smaller patchwork kits, sashiko projects, all the associated sashiko tools and embroidery threads you will need as well as oodles of Japanese crochet loveliness. Ooooh, the Tulip crochet hooks! The fine cotton threads! The fringing possibilities for linen handkerchiefs the world over! Yet for all the Japanese crochet loveliness there weren't as many crochetty, knitty stalls as I had anticipated. It was late autumn when the Fair was on so I had presumed a perfect time for spruiking woolly delights. 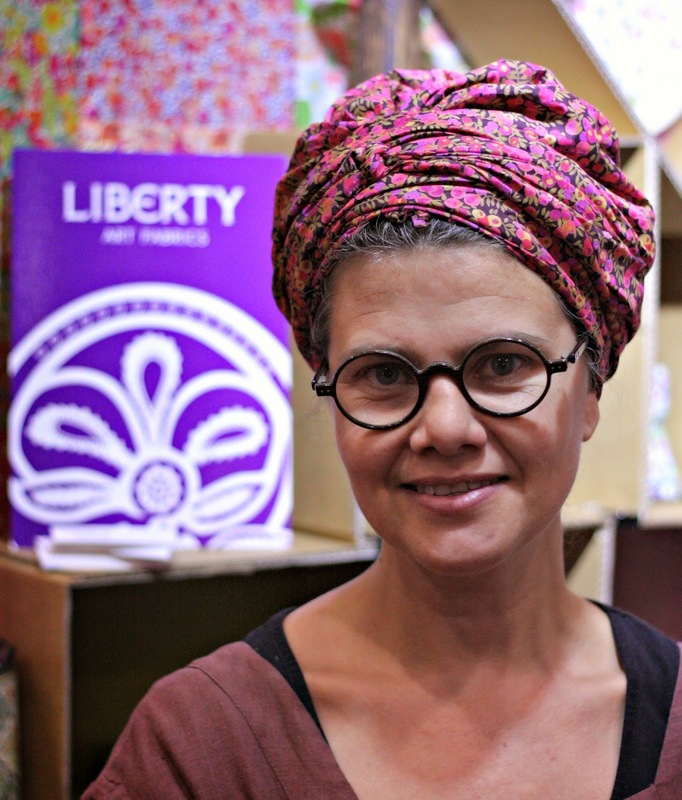 Nonetheless, the leading light of the woolier textile stalls was Prudence Mapstone of KnotJustKnitting and her freeform crochet or fibre art. 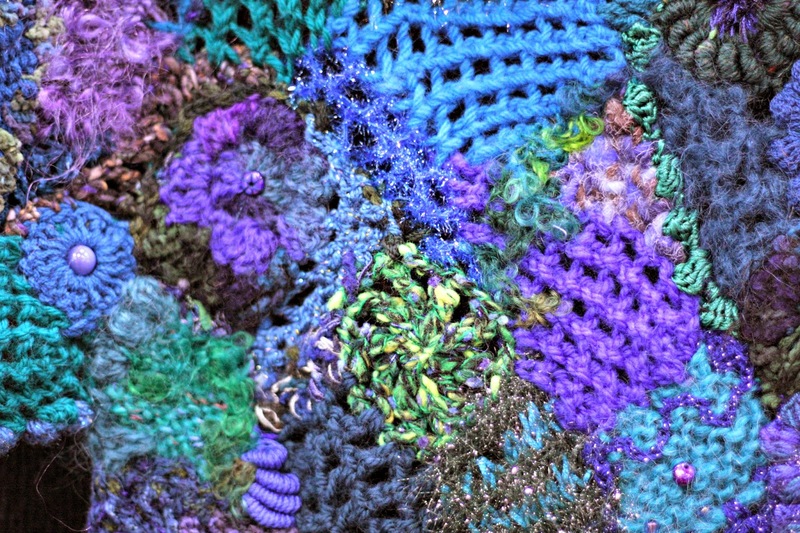 What a joyful concept Prudence's freeform crochet is. Using scraps of yarn of all weights and fibre types the aim is to crochet whatever patches and patterns come to your mind. These deliciously textured samples and motifs - called scumbles - can become pieces of textile art in their own right or brought together to construct functional yet striking clothing and accessories. Prudence's work has a great vivacity and exhilaration in it, born of such a simple yet terrifyingly liberating idea. She's written a book or two about this freefrom skill if you want to find out a bit more or would like a bit of guidance before you launch out on your own. So there you have it. 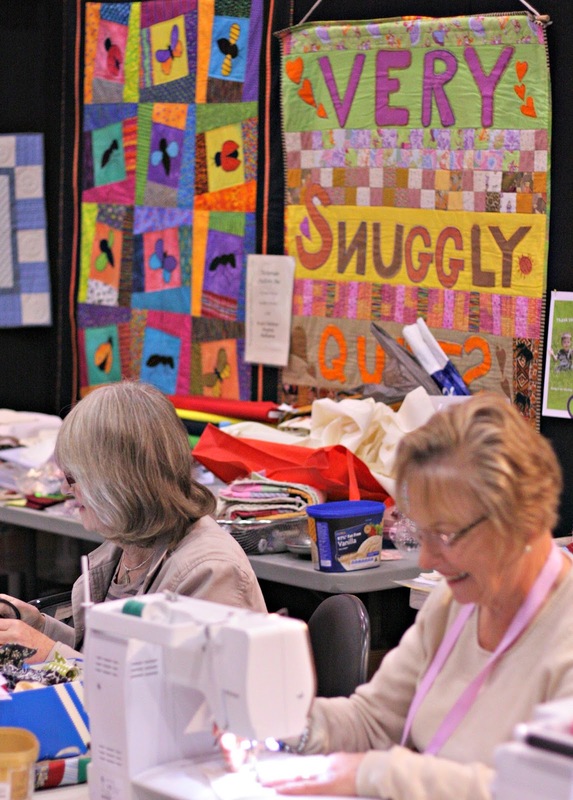 My thoughts and ramblings on the Melbourne Craft and Quilt Fair 2014. But what of my acquisitions? Of course there were such things. What limited will power I have at the best of times is incinerated within microseconds by the nuclear blast of temptation these craft shows provide. It would have been rude not to have bought a quilt kit. So I did. A retro-tastic and simpleish one from the Crafty Squirrel and an accompanying wooden stitch-picker topped by a small doll with which to unpick my almost inevitable stitching balls-ups. Also some Liberty print covered button for the seemingly never-ending Heathered cardigan I am making. Oh, and a divine mohair and merino 2-ply from Touch Yarns - acquired at the Wondoflex stall - which will one day become a Banana Leaf Shawl.